Find and Book a New Mexico Elk Hunting Trip with a Professional, Pre-Screened New Mexico Hunting Guide / Outfitter. Elk (Cervus elaphus). 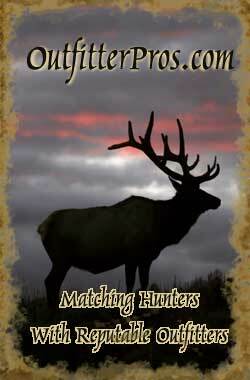 OutfitterPros.com features 18 Elk hunts with 9 professional New Mexico hunting guides and outfitters. All outfitters are licensed, insured, and have passed our exclusive 5 point rating system. These are semi and fully guided Elk hunts in New Mexico with some of the best Elk hunting outfitters and Elk hunting guides in the world! Bow, muzzle loader, and rifle hunts on both private and public lands. Some of the biggest elk in the country are killed in New Mexico every year. Visit our Elk Hunting page that provides detailed information on top Elk hunting trips for all top destinations. Guiding hunters to trophy class animals is our business and our promise to you. A quality hunt is the only option. We offer archery, muzzleloader, and rifle hunts in Arizona and New Mexico for Elk, Mule Deer, Couse Whitetail, and Antelope. All hunts are fair chase and take place on public and private land. We hunt only the high quality areas where the hunter has the capability of taking a quality animal. New Mexico has excellent opportunities at trophy Elk, Mule Deer, and Antelope. So let us apply you for these quality hunts by putting you into the public draw in New Mexico, since they do not have a bonus point system. You will be put in a separate drawing pool which increases your odds of drawing one of these quality tags. We can also apply you for Arizona hunts. Unfortunately, Arizona does not have this separate drawing pool but they do have a bonus point system, folks these tags are surely worth the wait. We offer fully guided or guide only hunts for all species. New Mexico offers great opportunities for the mobility impaired hunter for Elk and Antelope. We can apply any hunter that qualifies for these hunts. So give us a call about these special hunts. Arizona is the premier state for western big game hunting. Although tags are hard to draw the hunter is surly in for the hunt of a life time. We are now booking for private ranch hunts for elk, deer, and antelope in New Mexico. We also have available unit wide tags for Elk in high quality units. All of these tags private or unit wide are guaranteed hunts. We can book a year in advance for anyone of these tags. Give us call availability is limited. For more information, you can request a brochure by sending us an email.